I recently had the pleasure of being introduced to a company here in Atlanta called The Surface Masters. 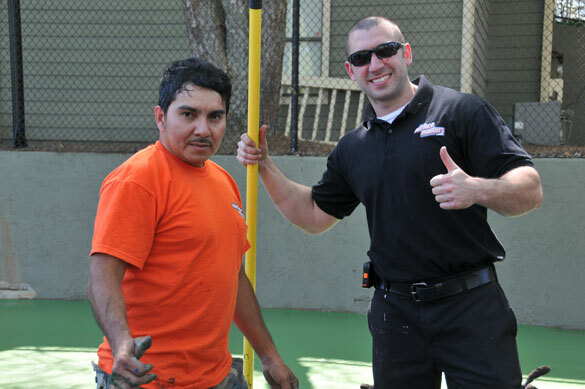 They are a full service pavement maintenance company who also specialize in sports surfaces. It’s a niche they’ve done well at in the Atlanta area, especially with apartment complexes and home owners associations. One of the main reasons for this (in addition to the fine work they do) is that they can offer a complete package that services not only the customers sports surfaces, but also maintain and repair all of their existing pavement. 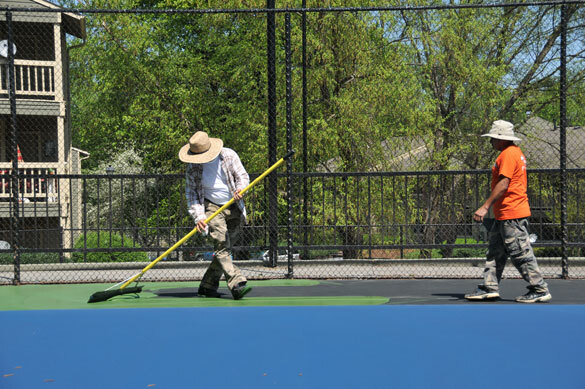 Justin Meier, General Manager of The Surface Masters, invited me out on a recent tennis court renovation to learn about the process. 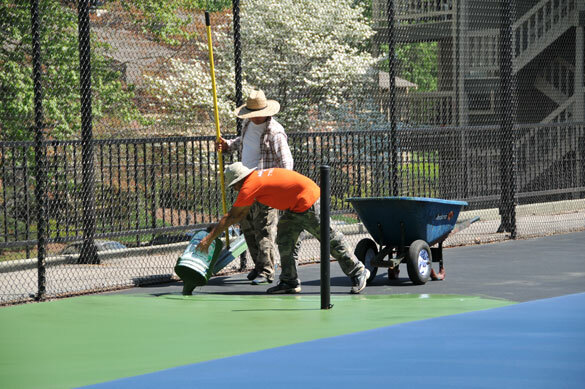 Resurfacing a tennis court starts out much like any other asphalt maintenance project, by cleaning the surface. The courts that Justin and his crew resurfaced were in pretty bad shape, so making sure all of the dirt and built up residue was cleaned off was of the most importance. 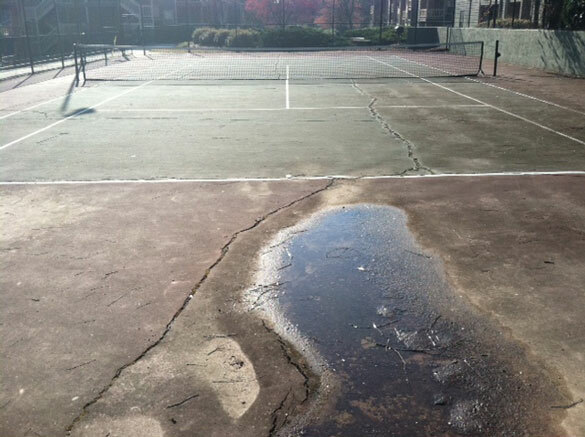 They typically will pressure wash their courts first and follow up with a degreaser if needed. Just like on a sealcoating job, if dirt or any foreign matter lies between the surface and the sealer, it won’t last. Next, The Surface Masters had to tackle the cracks and imperfections, and there were plenty of them. In places the cracks were 3 or 4 inches wide. In some areas tree roots had pushed their way up from under the surface and created large upheavals. After thoroughly cleaning the cracks and removing bad areas, The Surface Masters used Sealmaster’s Acrylic Patch Binder and Crack Patch to seal up all cracks and level / repair low spots and depressions. On really large voids and deep cracks they sometimes will add a layer of cold patch first and then follow with the patch binder. After the court had been thoroughly cleaned and all cracks sealed, the entire court was resurfaced using Sealmaster’s Acrylic Resurfacer to smooth and level the surface. 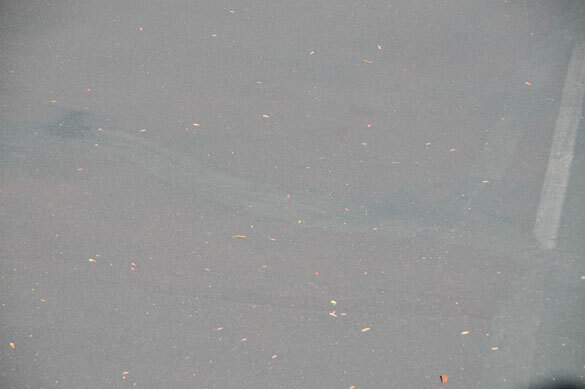 As with a typical pavement sealer, sand and water are added to create the right mix design. 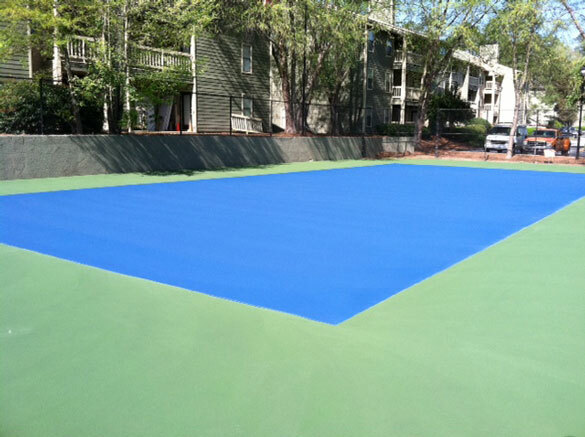 A typical mix design for a tennis court would be 55 gallons of resurfacer, 33 gallons of water, and 800 lbs of 50-60 mesh sand. Justin’s crew will typically perform a two coat application, allowing it to cure for 24 hours. The next step is to add the color coats. Sealmaster’s SportMaster brand offers a wide range of colors to choose from to create great color combinations. The Surface Master’s customer chose a really sharp looking blue / green combination. As with the resurfacer, sand is added to the color concentrate to achieve the right amount of skid resistance. An 80-100 ultra fine mesh sand is added. The color coating was then applied with a hand squeegee. 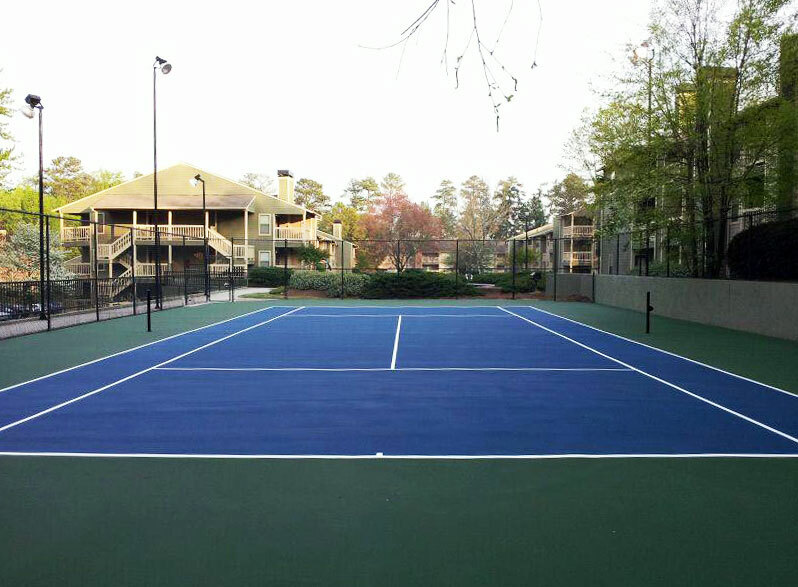 If it is a two color court, as was the case here, the inner court color is applied first. After the first color is applied, (2 coat application) the outer playing court lines are chalked off to ensure the new color doesn’t go into the inner court area. It should be noted that one important way applying the color surface differs from adding a typical pavement sealer, or even the black resurfacer, is how the coating is poured on and applied. 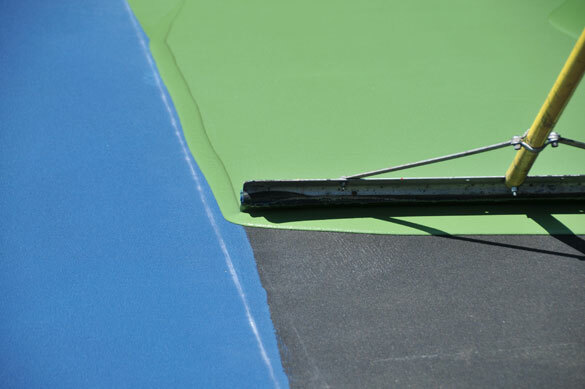 The color coatings must be applied to the existing “pool” of material and thinned out relatively quickly. This is important because the color will leave dark stains if allowed to sit too long. After the first coat is thoroughly dry (in this case overnight) a second coat is applied using the same process. The last step of the process is to add the court lines. If it is a resurfacing job, you will usually be able to see the old lines through the new surface. However, it is always a good idea to measure and chalk off the court regardless to make sure you get it right. After the playing court is chalked off, The Surface Masters use a line taping machine designed for laying 1 to 4 inch stripes on sports surfaces (Sealmaster). Two coats of white textured line paint are then applied with a roller. As you can see, the results of The Surface Masters work is absolutely beautiful. I was impressed with their professionalism and attention to detail. It certainly makes a big difference when you see the end product.